Fistful of Gun is a top down arcade shooter that's best enjoyed with friends online or off, though it does support single player as well. It features quick round gameplay, a varied skill ceiling and some eye catching pixel art. The premise is pretty simple. Pick from a large variety of characters, who all play very different from one another go out and shoot a bunch of stuff and dudes as the title would suggest. There are 2 main modes with a single and multiplayer variant to them. Arcade mode has you going round to round clearing the screen and at the end of the round you get to pick from an assortment of randomly generated upgrades. In story mode you can play either as a hero, or a bandit. As a hero you'll avoid innocent NPCs while shooting out the baddies. You'll get upgrades if you can find a store keep, or if you're lucky from barrels and crates. While if you play a bandit, you'll be doing similar except you'll be shooting every one, innocents be damned, and collect all the bounty from from your massacres. The balance to playing the bandit is, every one will shoot you on sight, and store keeps are rarer, as they tend to fear and run from you. The game's flow is pretty fast paced, some rounds only taking seconds to complete, though there will be a variety different events that may take more time. The game also runs on a limited continue system, and it's very possible to get a game over in your first few runs. It plays a lot more like an arcade classic than a modern game. Permanent gameovers, no quick save or loads, and a limited life counter are rarities in this age of gaming. Because of this, the game does benefit from faster paced style of gameplay, but that also means the game is short, can be potentially repetitive to some. The game is a lot of fun, but there are some issues I take with it. Though the character selection is fantastic, and I love how each character are so drastically different from one another the game can feel a bit samey after an hour or two. Even with the character variety you will be shooting and dodging over and over again, with only a handful of random events that help mix things up. To be fair, the game does help alleviate some of the monotony not just with character selection, but also with game mode variety as well. The game's controls can also be an issue at times. Some characters just play better on the keyboard and mouse, while some better on the gamepad, this is mostly due to the huge degree of divergence in the characters' play style. Though this is certainly something to be admired about the game, it also does require the player to have an encumbrance of hardware ready at hand to fully enjoy the game to it's max potential. Also be aware, during our time with the game, we also ran into some bugs as well, some gamebreaking, but since the writing of this review, I have noticed dozens upon dozens of updates. It's very possible they're patched out. 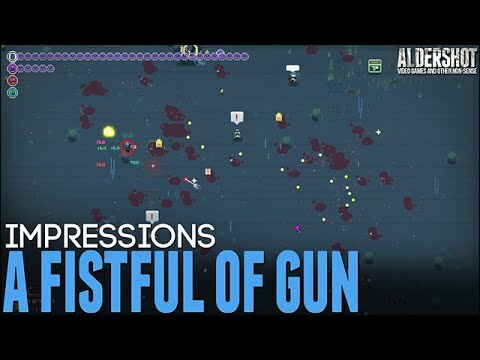 Overall A fist full of Gun is a really interesting top down arcade shooter. It's not perfect, and can be repetitive for some, but it does have a lot of potential, especially if the continue to support the game with more maps, and events, as that's what I think is lacking the most.